Ok, so we’ve all heard that spinach is healthy. Most everything you read on the Internet refers to spinach for the Super Food, calling it the healthiest food of all time. 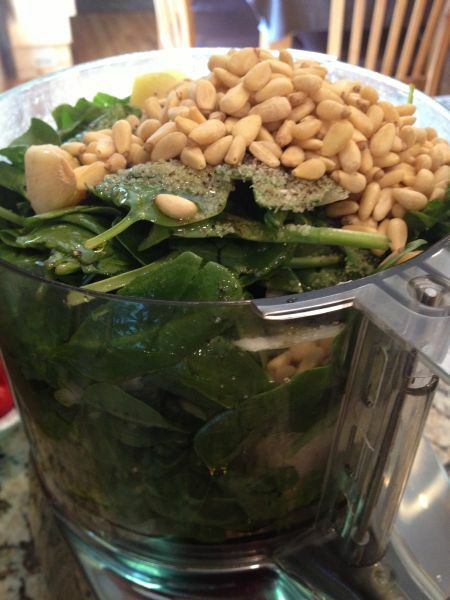 I loved Popeye growing up and he made himself super strong by eating spinach! 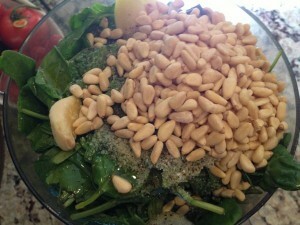 I am always trying to incorporate the best ingredients into our diet. I didn’t necessarily know that it contains dietary fiber which helps in digestion, prevents constipation, controls blood pressure (good for Bill) and curbs over eating (good for both of us, who knew!). I’ve learned that it also helps protect against inflammatory problems, cardiovascular problems, bone problems, and cancers at the same time! 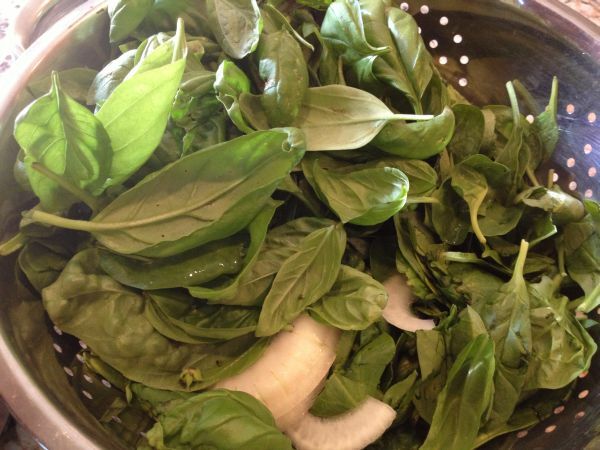 I also didn’t know that spinach has a number of antioxidant properties and is the highest vegetable protein around! 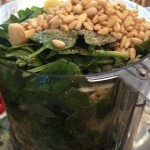 One cup spinach = 12% DV protein. We’re not getting any younger and so anything we can do to improve our health, I’m in! The bright green vibrant-looking spinach leaves are appealing to the eye and because I know that it’s nutritious, I tend to buy it in bulk. The problem is that I assume it is going to go to good use and all get eaten, but it often doesn’t. 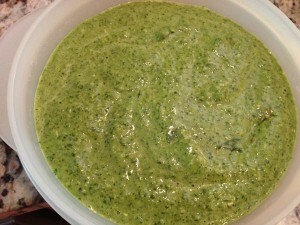 I hate to waste food, so I created this pesto using up some of a big bag and incorporated some of the wonderful, fresh Basil that’s growing rapidly out on my porch! 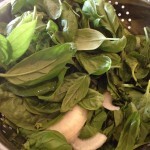 You can add this pesto as a topping to fish, chicken or pork or add it to a pasta dish like I did for a quick and easy meal. You may wish to omit the Parmesan cheese and then add it once thawed. It’s super simple and delicious. 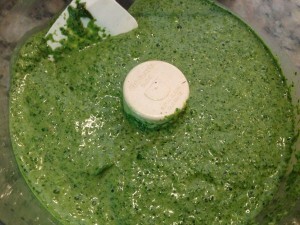 It has a mild, fresh taste; so next time you have too much spinach give this a try! Place all ingredients into food processor and process, drizzling the olive oil down into it until it comes to a fine sauce/paste. Stop the processor from time to time and scrape the sides of the bowl with a spatula as necessary. Taste and adjust seasonings and use immediately. I tossed the pesto with some spinach infused pasta and topped it with freshly sautéed shrimp and scallops. Garnished with a bit more Parmesan cheese and it was delightful with a glass of nummy Beringer Cabernet Sauvignon! 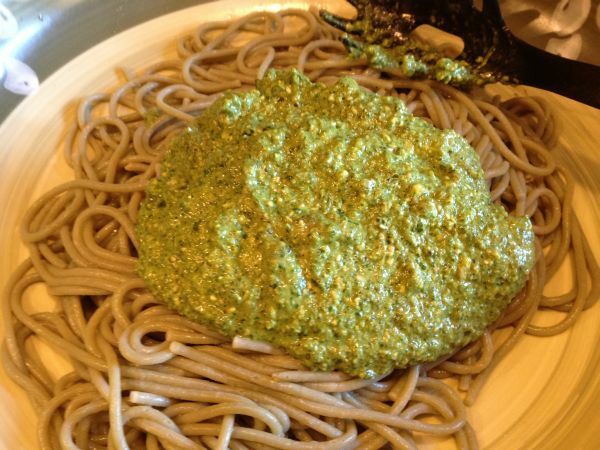 You can transfer the remaining into a container and top with a thin coat of olive oil to prevent the top of the pesto from discoloring. It will keep for weeks in the refrigerator. This sauce is also good for freezing. 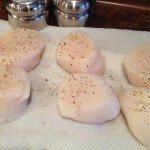 Use ice-cube trays, or small containers. 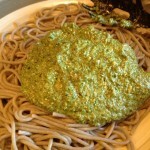 To assemble the dish, cook pasta according to package directions in salted water. Do not drain. 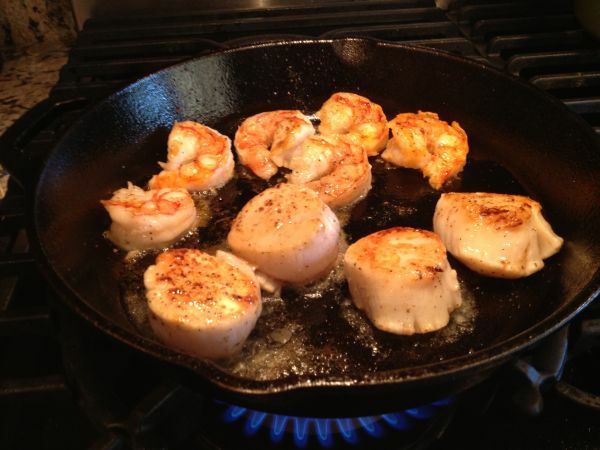 To prepare the shrimp and scallops, season each with salt and pepper on both sides. Sear them by heating two teaspoons of oil (you can add butter if you like too, some chefs recommend searing in oil only and omitting the butter, but I like the flavor.) in a very hot skillet. If you choose to use butter, you do not want it to burn, so heat it with the oil until it just begins to brown and smoke. 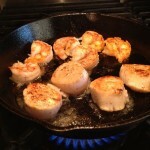 Gently add the scallops to the skillet cooking one and a half minutes on each side. They should have 1/4 inch golden crust on them, while still remaining translucent in the center. DO NOT overcook them. 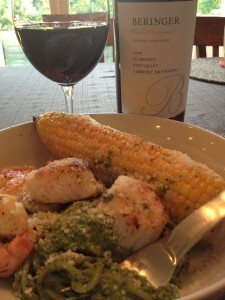 Toss the pesto with the cooked pasta and top with the cooked shrimp and scallops.